On Saturday I was lucky enough to attend the Curve Fashion Festival at the Exhibition Centre in Liverpool, I was very excited about the event and planned my outfit for the day. This is also my first full outfit of the day post on my blog, I've used my Instagram to post #ootd photos previously but never published a full blog post. I wanted to take this opportunity to tell you about my outfit and hopefully this can be the start of something new for me and my blog. My outfit planning started with my skirt, I found this leather-look skirt in my local Debenhams store at the Warehouse concession for just £10.00 reduced from £38.00! 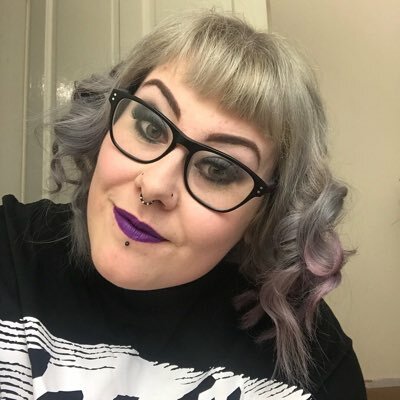 I wasn't sure about Warehouse sizes as I'd never purchased from them before so I did try this on in store and it was a perfect fit, don't you love it when you find something that fits nicely and your comfortable wearing it? What I particularly like about this skirt is that it has pockets; I've not seen many leather-look skirts with pockets before so I was chuffed that I'd have somewhere to put my phone. The raw hem on the skirt is also a little different to what I'd seen on other skirts so I like that feature too. 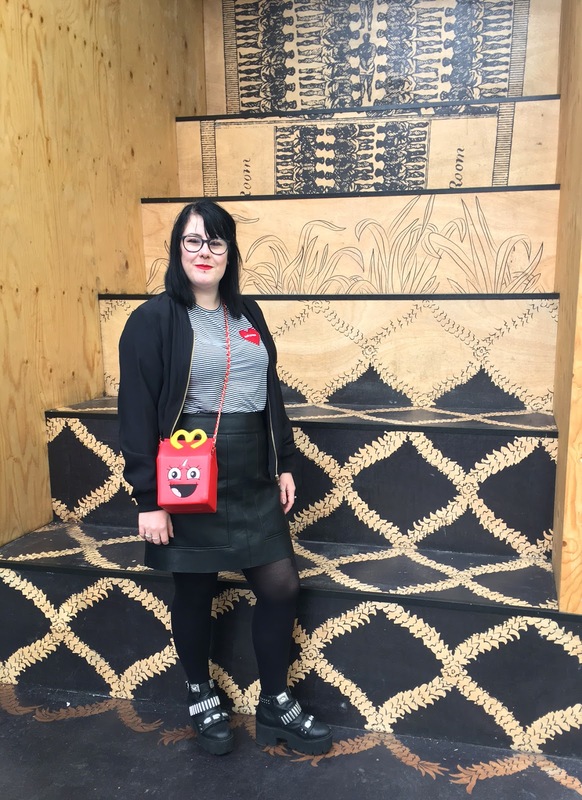 I teamed my Warehouse skirt with a £6.00 tee from Primark, this t-shirt took my fancy because I loved the little heart patch. 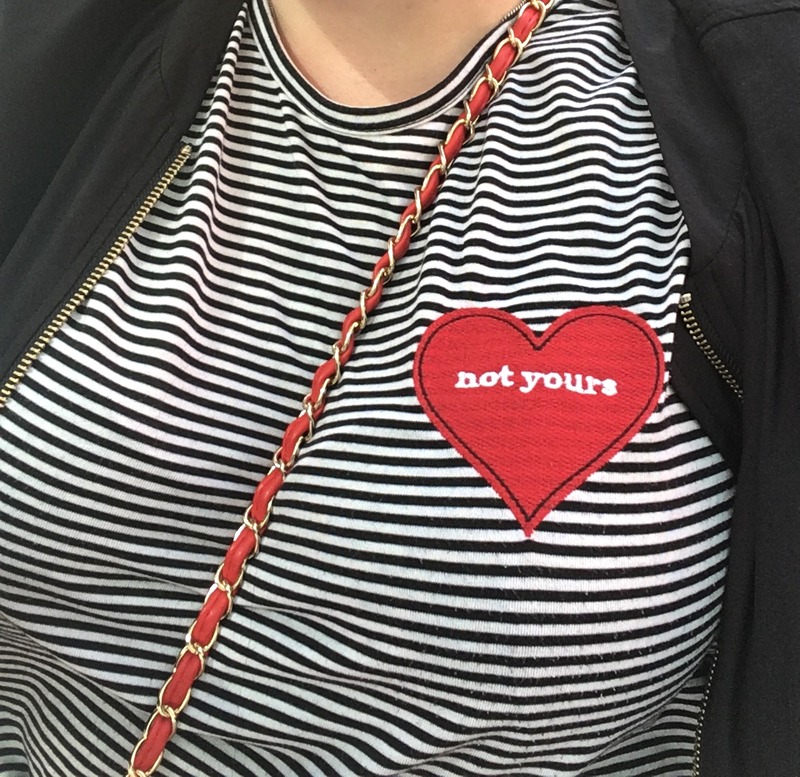 The appliquéd patch says 'not yours' in the middle of the red heart which is a little fun statement that, to me gives this tee an alternative feel to it. The red patch contrasts against the black and white stripe making it stand out. I tucked my tee into my skirt so you get the full effect of the skirt and all the details of the tee are on the upper part of the shirt anyway. Of course I wore tights with the skirt as I'm not too confident wearing a skirt in general and I wasn't sure what the weather would be doing on Saturday; lucky the rain stayed clear but there was a cool breeze so the tights was a good option. Now to my boots... I freaking love these boots!! Asos had these boots on sale a while ago and they was consistently out of stock; I was stalking the website daily to check for stock updates and one day they had a pair in stock and they was in my size, I think it was meant to be. 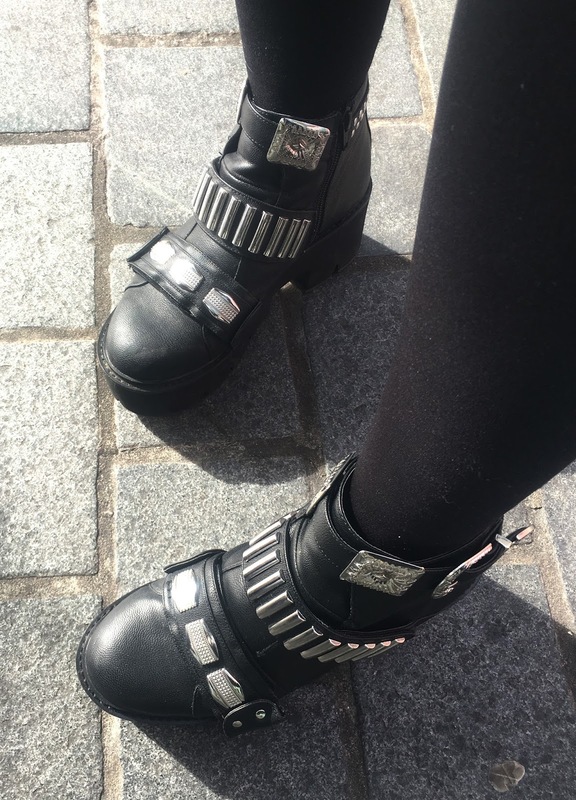 These chunky heeled buckle boots are very comfortable even with the heel because the sole is very flat; the insole is also cushioned for comfort. The zip up the inside makes putting them on easy and again comfortable. I choose to style these boots with my outfit to add to the edgey look I was going for; I'd say these boots are more on the alternative side. I wore a jacket when not inside event building and this was a black silky bomber jacket purchased from Matalan; these where £25.00 but I had a 25% off voucher so I got the jacket for £18.75. I'm always on the hunt for a bargain or using vouchers to save money because who doesn't like spending less? Finally to the star of my outfit and to what caused a stir throughout the day; my handbag! This 'Crappy Meal' handbag was brought from DollsKill last year when they had a sale on; it cost me around £15.00 in the end which was a steal and I ordered it on one of the free international shipping weekends. 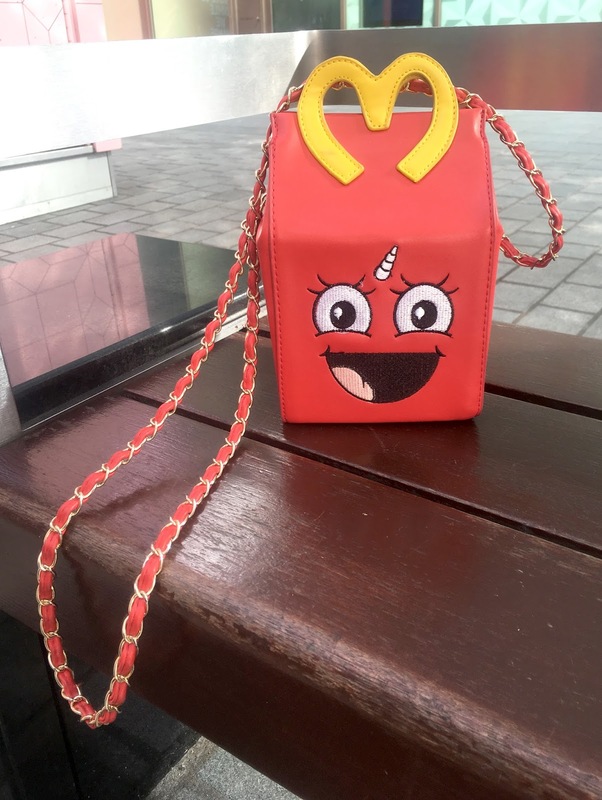 From getting off the train in Liverpool to arriving back at home my bag was getting compliments, stares and one woman even took a photograph and started to google happy meal bags! The inside of the bag is quite roomy even through it doesn't look like it, I managed to fit my camera, purse, keys, makeup, a tote bag and a coin purse inside. I choose to use this bag because it is red and matched the red patch on my tee and my lipstick for the day which was Urban Decay's shade Iracebeth from the Alice Through the Looking Glass collection. So here you have it, my first OOTD post which now I've got to the end of it, I'm pretty nervous to click that publish button; I'm out of my comfort zone and hate having my photograph taken but I'm trying to change that and be a little more confident. Let me know what you think anyway and if you'd like to see more outfit posts in the future. PS - My camera died whilst at the event so these photos was taken on my iPhone.